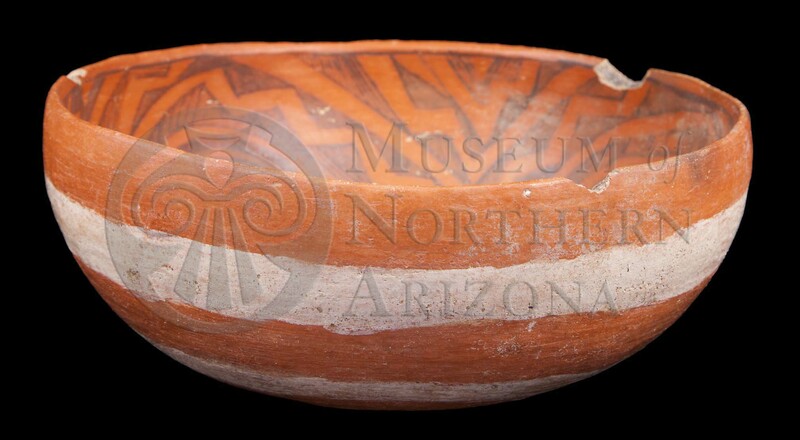 St Johns Polychrome bowl from the Museum of Northern Arizona collections. Click the image to open the St Johns Polychrome gallery. 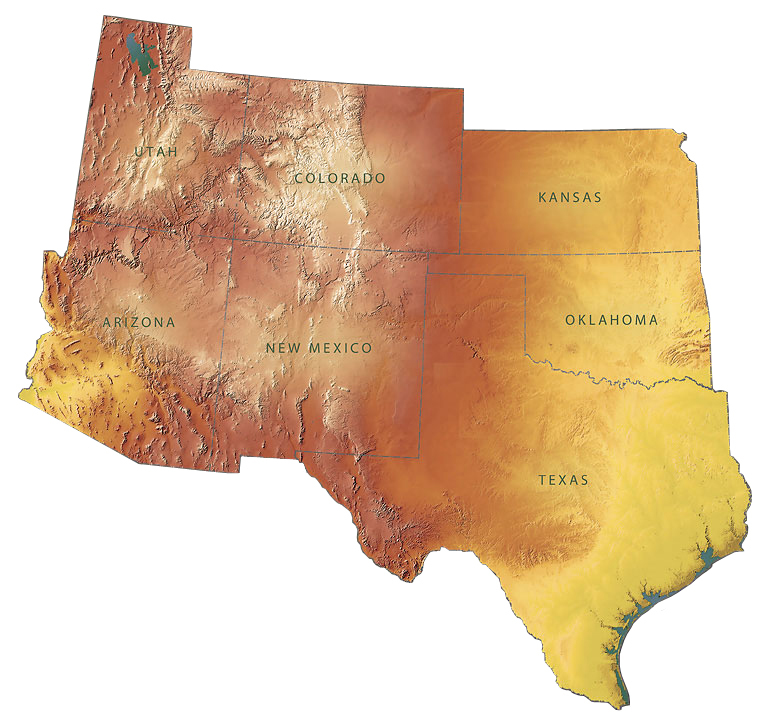 St Johns Polychrome is a type of White Mountain Red Ware found from Mesa Verde to the headwaters of the Pecos River, south to Casas Grandes in Chihuahua, Mexico, and west to Chino Valley, Arizona; this type was widely traded. Core Color: Gray; gray-yellow if oxidized. Temper: Black, white, red, or buff angular fragments of crushed sherds, sand, and/or crushed rock. Surface Finish: In most cases a thick red slip covers bowl interiors and exteriors; polished. Pitting over inclusions is common, and inclusions frequently protrude through the slip. Some crazing and fire clouds are found on the exterior of the vessels. Surface Color: Red, orange, or in-between. Forms: Bowls, jars, and dippers. Paint: Black and white (exterior); matte, subglaze, and glaze. Pigment: Black: combination of copper, lead, and manganese; white: presumably kaolin. Design: Frets, keys, meanders, opposed half terraces, scrolls, animal forms, hands or stylized hands; banding, framing, and hatching lines; exterior elements are broad lined geometrics. Comparisons: Differs from St Johns Black-on-red only in the use of white paint on vessel exteriors. Similar to Wingate Polychrome, which has more open spaced designs. Heshotauthla Polychrome differs from St Johns Polychrome in that the paint is always subglazed or glazed, exterior lines are fine, and hatching is absent. Springerville Polychrome is a variant of St Johns Polychrome that has a thin black line with the white exterior line. Other Names: Black-on-white-on-red; three colored painted ware; Little Colorado Black-on-red; Chevlon Ware; Little Colorado Polychrome; and Springerville Polychrome. Carlson, Roy L. (1970) White Mountain Redware: A Pottery Tradition of East-Central Arizona and Western New Mexico.University of Arizona Press, Tucson.